Are you considering using virtual reality as part of your employee training programme? Unsure of why or how you could use VR to train or where to start? We spoke with Jeff Baumohl, Vice President of Product Marketing & Alliances at TalentQuest a talent management company offering VR solutions, to offer his insight and advice. 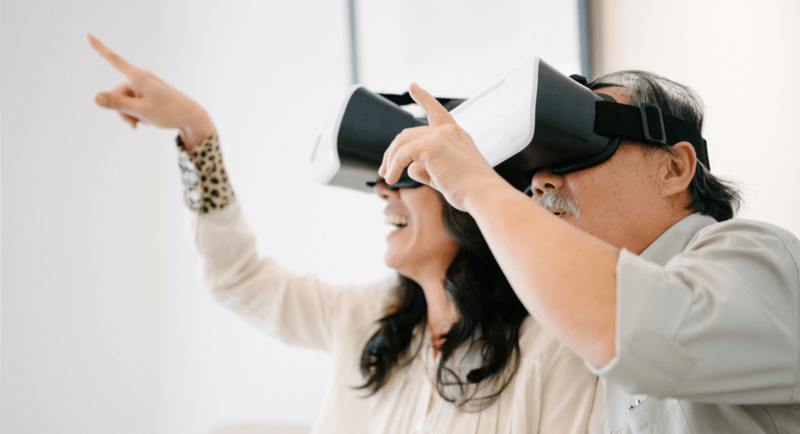 He delves into why and how organisations are using it today, how they're measuring the value, and what you should take into consideration when choosing a partner to launch VR training in your organisation. What are the primary benefits of using VR to train employees? I’m going to answer that in two ways. What you’re able to accomplish with VR is to allow an employee to simulate the actual experience in a situation that often can’t be replicated unless they’re doing the real thing. That drives up the retention of what you’re teaching because when you train in VR, you’re able to keep the mental memory of what you’ve done. The best analogy that I’ll compare it to is learning a sport. When you learn a sport, you have a coach and you practice and the reason that you’re practicing is because you’re trying to create that mental memory of the activity that you’re being coached for. We’ve heard the analogy that it takes 10,000 hours to become an expert at anything so when you think about corporate learning, one of the biggest elements that’s often missing is the ability to practice. We don’t often give trainees the ability to practice what they’re being taught to develop that new skill. It’s not always the case but when you think about so many different types of training in a corporate setting, in many cases it’s very difficult to replicate them. Think of safety training. You can walk through a simulated plant but physically how realistic is it to bring employees if they are in multiple locations to these simulation centers? Think of large industrial equipment. Again, there’s both the practicality of getting it to people or getting people to it but then there’s also the safety aspect of it as well. There is plenty of literature out there about how surgeons are embracing this technology to practice a particular surgery before they do it. And It’s all about risk and being prepared to do the actual job. Another way to look at it is in the world of assessments, there has been lots of research that talks about the predictability of assessments and the greatest predictor of job success is watching how someone simulates the job. VR can be used to assess someone prior to a training and understanding what it is that they know so that you can very precisely define their training needs. You can use it to allow them to explore, play, practice. Give them the knowledge, walk them through it, and then ultimately it can be used to assess their competency after they’ve been trained or you can use it to reinforce and practice on an ongoing basis. Going back to the surgery example, let’s take at that and how doctor’s use it and let’s think about someone who works on industrial equipment. If they haven’t worked on a particular piece of equipment in a while, wouldn’t it be great to be able to do a quick refresh? Can ROI help you to better measure the application of skills learned? What’s interesting is that there are a number of organisations who have just started in the VR space creating learning content. We’ve been creating immersive content for quite some time, virtual reality allows us to take that immersion to full immersion but we’ve been creating in-depth 3D simulations that can be done over a PC or on a mobile device for several years. So a great example of what VR can do for ROI is a fast food restaurant we work with. They do a classroom training for new managers and assistant managers and they would bring them within a certain territory to a particular restaurant to then get certified but they understand that with each shift there is a very specific set of procedures on how to inspect the restaurant, the kitchen, the employees, just to make sure everything is up to standards. And so we actually built a 3D interactive, videogame-like solution, where they’re able to walk through the restaurant. They can interact with whatever they’ve defined as interaction points, it’s randomized, it’s gamified, and this is what they use to certify new managers. Now my point here is that from an ROI perspective, it has allowed them to accomplish a few things. First, there’s certainly a cost-reduction in travel. Second, it’s standardized because before in each different training facility, the dynamics were a little bit different. Third, they get data. Companies are able to see all of the different patterns of interaction and so because of that, they’re able to understand job performance and driving job performance is really what training is intended to do. If there are patterns that are unexpected in a negative way, then let’s understand why they exist. Could it be that we are training incorrectly, or one of the things that we don’t think a lot about in the training space is the physical environment. Are there things within the physical environment that limit job performance. To sum it up, we’re not just talking about training. We’re talking about improving job performance and we’re looking at it not just from the context in what they’re being taught but also a more true-to-life picture of how people will actually perform. What advice would you give to L&D professionals interested in using VR to train their employees? There are a couple of things that I will share. I have the privilege of taking this technology and letting professionals experience it for the first time. You can’t understand the impact unless you’ve actually experienced it. Right now the demo that I tend to share is a project with one of the major airlines. For them, one of the riskiest roles is for the people who push back the airplanes. The reason it’s so risky is because there are so many things that are going on at once. Some of which are communication with the pilots and making sure that there’s no obstructions or safety issues so they actually help inspect the airplane. I have people simply put on the goggles and let them experience VR. With the audio and visuals it’s like you’re on the tarmac and you’re hearing the engines and you have to interact with the pilots and watch their signals. You also really need to understand what problem you’re trying to solve and you need to understand what technology would best meet the needs of your organization. Because with some of the higher-end game-based technology you really need to be stationary and in a centralized location whether it be in a lab or a conference room. When you think about organizations that are field-based, you can certainly create mobile-based VR. It’s not necessarily as visually rich as what you can do with the game-based solutions, but it’s highly impactive. It’s also understanding what’s the right application to use it for. If you think about the continuum of learning, there’s a few things that we’re trying to accomplish. There’s the skills-acquisition component to learning. So, that’s kind of the first phase. The second phase is how do we get someone to retain it, and the third phase is how do we get them to sustain it. VR can be very helpful for the retaining and the sustaining phase in almost in all cases. In some cases maybe it’s right for that learning phase. In other cases, the classroom setting or more traditional e-learning content is more appropriate. Make sure of the learning objectives and consider what will be the best form of delivery for your organization based on your geographic and technology footprint. Lastly think about the best way to get people to practice and engage. Those game-based VR systems are going to provide the richest experiences. However, if there is something that is not as technical or sophisticated in nature, then the mobile VR can also support those needs as well. How does an organization know they’re ready to use Virtual Reality to train? They’re ready when they have a specific problem to solve and recognize that the technology can help solve their issues. Very often when we show organizations our solutions, we don’t present them necessarily as VR. We present them as immersive learning. Very often the projects will begin as more of the traditional 3D-based solution and then we’ll often just develop a little bit of that in VR and let them see the impact and they return to us with ideas on how they can use the technology to improve their training. How do you choose the best company to meet training needs with VR. What do you recommend they ask in order to work with a good company? I think there are two broad categories of companies working in this space. One of which is technology companies who are creating VR content, and the second is L&D organizations who are now adding VR to their battery of solutions. If you know exactly what you need, then a technology company can certainly help you get there. However if you need a little more of a consultative approach to work through your learning objectives and figure out the best way to deliver them and what combinations of technology are the ones to best accomplish them, then obviously organisations that have the L&D expertise can offer a tremendous amount of value. In terms of evaluating the technology, I think it’s a matter of getting to experience some of the work that they’ve done and getting references. I don’t think there’s a silver bullet but that would be my suggestion. A lot of training professionals who we've spoken with think that VR is exciting, but something for the future. Why would you say that VR is a training solution that can be included in L&D initiatives right now? If you do the research, you’re going to see the largest and most progressive organisations are using VR and so if you have a challenge competing now against the big guys, they’re just continuing to increase the gap because that’s not how they’re looking at VR. They’re embracing it. It may not be for all aspects of training, not everything needs to be fully immersed. But where it does, the impact is significant. To put this into perspective, when we began to introduce our technology, it was very often done at Chief Learning Officer conferences and as I shared, just about everyone would be interested. They wouldn’t always know what they needed it for, but they would come back. If you think about who is attending the CLO conferences, most organizations with CLOs tend to be a bit larger. They’re embracing their understanding of how they need to understand it. The largest companies in the U.S. across industries are beginning to leverage this technology. If you’re not considering it, you need to revisit your reasons for not doing so, because you’re just going to be putting yourself at a competitive disadvantage. There is a lot of conversation about the modern learner, but the fundamental reality is that the kids that are going to be entering the workforce in the next five years will not tolerate the PowerPoint presentations turned into video recordings as training. It is not going to capture their attention. They’re not going to sit through it, it’s not engaging and they’re not going to learn. It’s not how they are accustomed to interacting with technology. So it’s going to be very eye-opening when organisations recognize that their traditional approach to training that they’ve been doing for years is just no longer going to work. And it’s going to hit fast. The other piece of that is that organisations who are progressive with technology, that’s going to be a recruiting tool. TalentQuest, a broad talent management and development provider. With roots in behavioural science and assessments, the organization offers a range of key solutions including leadership development, succession planning, and consulting services. Recognizing the need in talent development, they expanded their immersive learning capabilities to include virtual reality solutions. Jeff Baumohl, Vice President of Product Marketing & Alliances at TalentQuest has over 20 years of experience in HCM & Talent Management driving strategic growth in organizations ranging from start-ups to Fortune 500 companies.